I’m late getting this out, but it’s been a Monday morning, for sure. Mr. Lambeau had a sick tummy this morning. That’s the second time in a couple days. Not sure what’s going on- maybe the heat, but he spends most of his time inside in the AC. He has wanted to go out and nap in the sun on the deck, so I guess that could be part of it. I am keeping him inside all day, and we are not going to attempt a walk on a day where the feels like temp is saying 100. He will also be on light rations for a day or so, and, much to his dislike, no treats. Hoping that gets him straightened out. Otherwise, it will be off to the vet for the doggo. It was a fun evening. We sat around the dining room table, had a few drinks, shared verbiage (that was for you, Ken! 🙂 ), and laughed a lot. Funny how it always seems people tend to congregate around the table. The BaldMan grilled skirt steak with chimichurri sauce (he makes a mean chimichurri) and tequila-lime shrimp, with a wheatberry salad. It was a tasty dinner with friend I have known for years. It’s nice to stay in touch with good people even after you don’t see them everyday. I had to replace a couple of the plants in the hanging baskets out front. Two of the calabrachia just didn’t make it this year, so I changed the dead stuff out for supertunias (yeah, just fancy petunias). They seem to do well wherever I put them. The veggie garden is doing pretty well , also. It always seems that after we get a good rain and then a couple days of warm, or in this case, hot sunny weather, the plants look as if they’ve grown several feet overnight. I do have one tomato that looks like it’s trying to take over the neighborhood. But it’s got nice green tomatoes on it, so I am pleased. Other things are starting to bloom and set fruit. Yum! Oh, and I think I forgot to mention that Smashwords is having their annual Summer Sale. So, all my books are on sale through the month of July. 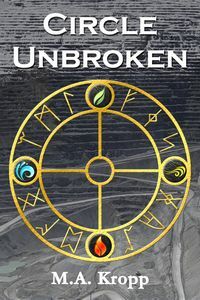 Circle Unbroken, my sci-fi novel is half price, as is Six of One: A Collection of Short Fantasy, which is, as the title implies, a set of short fantasy stories. The rest of my fiction is free, including the two stories in my urban fantasy series The Yo-Yo Files, and two short dystopian stories. You can check out my profile and the books here. Thank you! And remember, if you do purchase and read any of them (or if you have in the past), please leave a review. It doesn’t have to be 5 stars, and it doesn’t have to be long or profound, just be honest. Of course, I hope you like them! Reviews do help, and are appreciated more than you know. 100 degrees? Yeah, our dogs get yard squats when it’s that bad. He is just chillin’. This is brutal.